Brittle hair occurs when the hair lacks enough moisture to maintain its normal texture and sheen. According to the University of Maryland Medical Center, this can happen for a number of reasons such as washing or blow-drying too often, using harsh or irritating shampoos, or exposing the hair to dry environmental conditions. In rare cases, brittle hair may result from a more serious nutritional disorder. Most of the time, however, brittle hair can be treated with home remedies and by avoiding unnecessary stress on the hair. Peel a large, ripe banana, and cut it into small pieces. Transfer to a mixing bowl, and mash well with a potato masher or fork. Add the jojoba oil and honey, and stir well to combine. Continue stirring with a wire whisk until you achieve a thick, creamy consistency. Apply the mixture to dry hair, beginning at the roots and working through to the ends. Cover with a plastic shower cap once your hair is thoroughly coated. Leave the mixture on for 30 minutes to an hour. Remove the shower cap, and rinse your hair thoroughly with warm water. Shampoo as usual to remove excess oil, and follow with a light conditioner if necessary. Repeat the treatment once a week to treat brittle hair or once a month to prevent hair from becoming brittle. Make a new batch of the banana mixture for each application. Do not store. 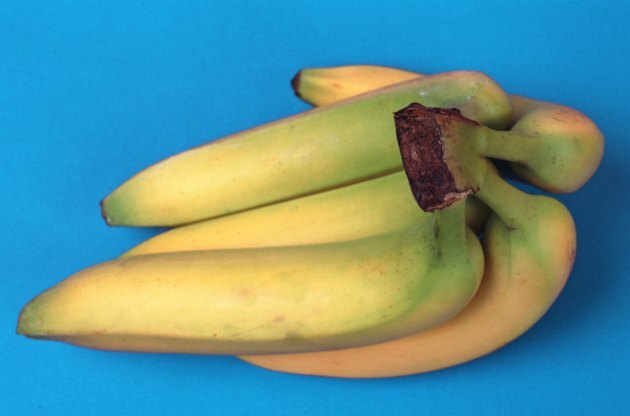 For best results, use a banana that has formed black spots on the outer peel. If jojoba oil is unavailable, substitute an equal amount of heavy whipping cream, which also hydrates the hair. If your hair does not improve after several weeks of using home remedies and you have avoided harsh soaps, heated styling tools, dry air and excessive washing, you may be suffering from a nutritional deficiency or thyroid problem. Consult a qualified medical practitioner for further diagnosis and treatment.